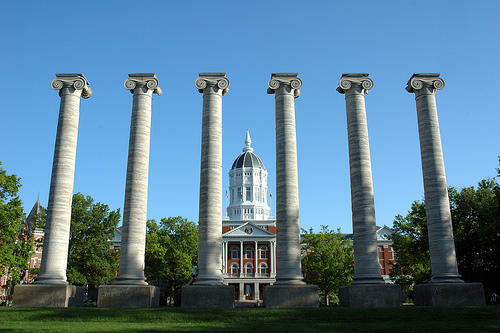 The columns at the University of Missouri-Columbia. “When you extract the pension funding from the Illinois report, what you see is we are in the bottom half of the country in terms of state support for our universities and community colleges,” Applegate said. According to Applegate, if Illinois’ higher education receives the 31 percent budget cut proposed by Governor Rauner, then Illinois would be ranked 6th from the bottom in state support. Illinois is an anomaly in the State Higher Education Executive Officer’s Association report due to the pension funding. Missouri, on the other hand, follows national trends. Since the recession, state and local funding per full time student has declined nationwide by almost 19 percent, even as enrollment has increased 8.6 percent. Funding has declined 27.8 percent in Missouri since the recession, with a 20 percent jump in enrollment. If the pension funding is taken out of the equation, both Missouri and Illinois have had relatively flat funding over the past six years. But because enrollment has increased in Missouri, there’s less money dedicated to each student. Applegate, Illinois’ director of higher education, attributes his state’s 16.5 percent enrollment decline in part to tuition increases. “We currently, for example, export more than 16,000 more students out of Illinois to go to college than we import from other states to come in to college,” Applegate said, noting that many of those students go to Missouri. Meanwhile, Missouri has kept tuition to state schools flat due to legislative constraints. But the University of Missouri System approved a slight tuition hike in February. And state appropriations continue to be historically low for Missouri. Like a beginning freshman plotting out college courses so she can have a marketable degree four years down the road, the Missouri Department of Higher Education is embarking on a new planning process to make sure students leave campus with skills to help the state – and themselves -- move ahead. But when the plan is finished, the final exam question will be this: Will its recommendations actually be used on the state’s campuses? 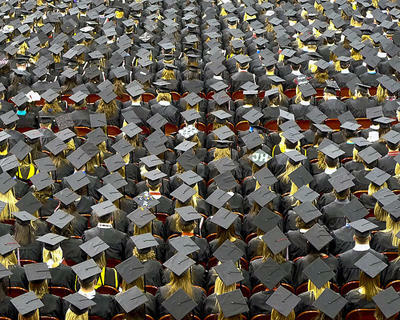 Millions of students are enrolled in college, but graduation rates are uneven. Why? Author Suzanne Mettler says political squabbling is to blame. As a junior in high school, Ayont Young figured she’d go to Missouri State University to study nursing. It was the only college she’d looked at and she was sure she could get in. Then, she signed up for College Summit’s summer Peer Leader program. College Summit is a local answer to the lack of academic support and resources in some communities nationwide. Program leaders encourage their students to reach higher and work harder – while giving them the support they need to do so.